The media frenzy surrounding the iPhone may have helped Apple claim a record share of customers for its portable line at the expense of its rivals Dell and HP, says a new survey from ChangeWave. An early August study that canvassed 3,665 of the financial research group's existing members' buying habits has revealed that nearly one sixth, or 17 percent, of respondents who had bought a notebook in the past three months had chosen one of Apple's MacBook or MacBook Pro models. The gain was an "unprecedented" jump from 12 percent in June and eclipsed the Mac maker's previous record of 15 percent set in January. 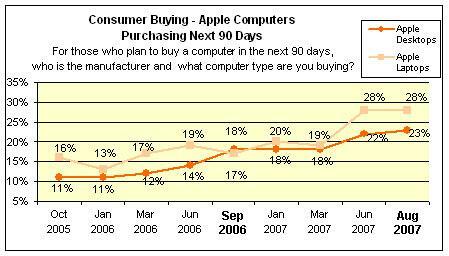 The computer builder was also set to enjoy continued high demand from future buyers, with 28 percent of those expecting to buy a notebook between August and October claiming that the system will be a Mac. Desktop demand was largely steady at 7 percent of past desktop sales and 23 percent of intended purchases, though the study completed just a day after Apple had introduced the new aluminum iMac. ChangeWave attributed much of the increase to a previously predicted halo effect created by the sheer publicity relating to the run-up for the iPhone. While the investment analysis firm didn't provide an explanation for why members were gravitating towards MacBooks, it did suggest that the spike in sales was triggered primarily by customers newly interested in Macs after exposure to the Apple cellphone and its marketing campaign. "The findings of our newest consumer survey are in and they show the enormous impact of that transformational shift [towards Apple]," said ChangeWave. "They serve as powerful evidence that the aforementioned 'halo effect' is indeed translating into real world Mac computer sales for Steve Jobs and company." In contrast, other computer manufacturers were said to have suffered in the latest rankings, potentially as a result of Apple's success. Hewlett-Packard saw a climb in anticipated desktop sales of five points, to 28 percent, but had ultimately lost three points in planned notebook sales to 25 percent —probably the result of "increased competition" from Apple, ChangeWave wrote. The analysts doubted that much of the lost share was funneling towards HP's frequent market rival Dell. Those surveyed were more likely than ever to have shied away from the Texas-based PC maker: future demand for notebooks had dropped from 28 to 24 percent while recent sales had advanced only one point from an all-time low to 29 percent. Some of this drop was potentially attributable to Dell's corporate sales, which dominate its income and typically avoid direct competition with Apple's preferred home market. No matter which company proved to be the source for Apple's increase, the survey backed its arguments by pointing to extremely favorable customer satisfaction scores. 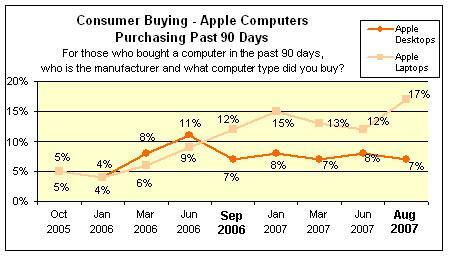 A full 86 percent of Mac owners, regardless of model, claimed they were "very satisfied" with their purchases. 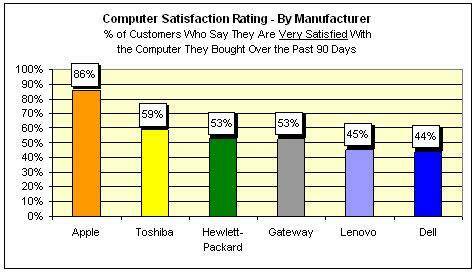 The figure was 27 points higher than for next-best Toshiba, which managed to please just 59 percent of its customers. 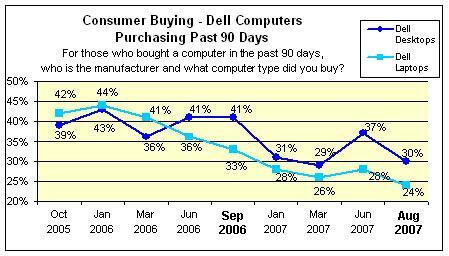 And like its estimated sales numbers, Dell once again suffered in the rankings. Of major computer makers, the manufacturer placed last in customer happiness and could only claim that 44 percent of recent buyers were truly happy with their product. "Once again —more great news for Apple; more ominous news for Dell," ChangeWave noted.